Flash Sale Alert! Lenovo A7000 Plus Price Drops from Php7,999 to Php7,499 Today! Lenovo A7000 Plus will be exclusively available today at Lazada by 12noon! The Lenovo A7000 Plus is efficiently equipped with powerful features that compete with flagship devices, features a 5.5-inch full HD display, impressive cameras, 360 degree audio experience via Dolby Atmos, Octa-core CPU and 3000mAh battery. It can purchased exclusively through Lazada at an unbelievably budget-friendly and affordable price of Php7,499 today! Lenovo A7000 Plus Flash Sale! Bigger, brighter, and more advanced features characterize the Lenovo A7000 Plus, which features a 1920 x 1080 resolution full HD display, allowing users to see dazzling visuals and stunning graphics in their truest colors and finest details from all angles. It offers a 360-degree sound experience thanks to the latest Dolb Atmos technology, giving the users a full and extensive multimedia experience. Non-stop talking, or back-to-back movie watching are a breeze, as the A7000 Plus is equipped with an incredible 3000mAh battery, enhanced with power-saving features to last all day. 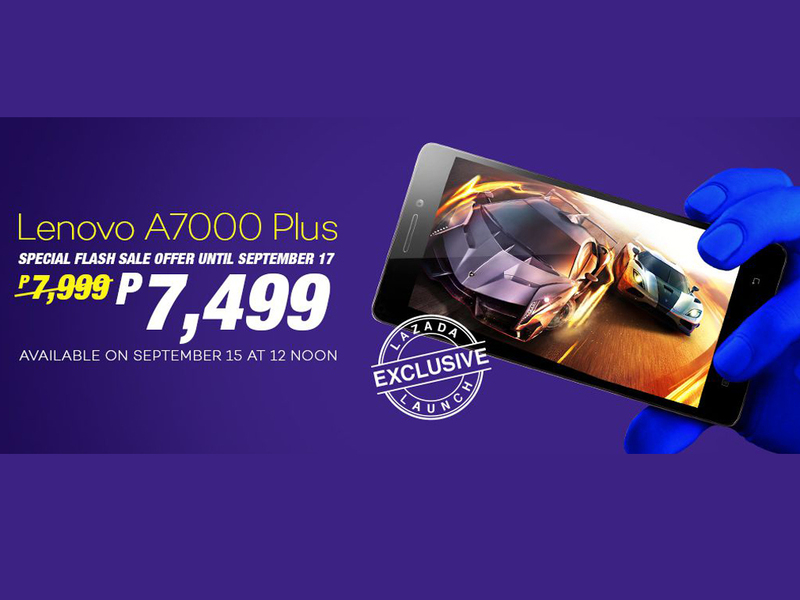 The Lenovo A7000 Plus will be made available through Lazada starting today (September 15) at Php7,499. The Lenovo A7000 Plus will be bundled with a free screen protector (worth Php299) & a free back cover (worth Php599).